I opened the doors on the storage shed and there was a wasp nest. Back in July, I noticed a flurry of activity at this same corner. One evening, I gingerly opened the top and noticed them starting a small hive. As that will not do, they were promptly hosed down. I thought that was the end of it. Nature, often, has other ideas. 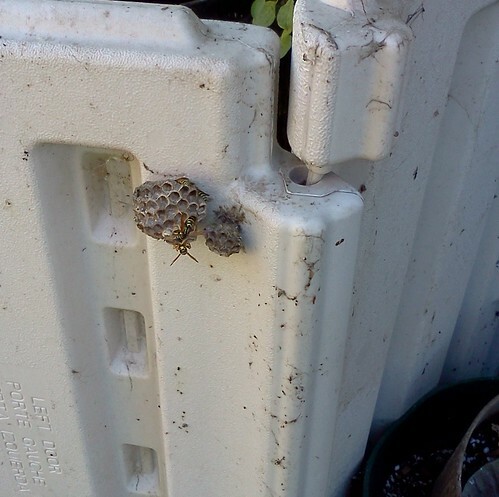 At first, I thought this was the hive I had soaked with wasp killer back in July. Then, as I watched, the wasps on this hive began to move. Well darn. I guess they decided to try to build again. I'm surprised I didn't notice a swarm around the gap in the side of the container. I soaked these wasps again and waited until they all fell off the hive. Then I knocked the whole thing down and crushed it. Admittedly, if I'd have waited until the first hard freeze, these guys would be toast to begin with, but they build on the previous year's work and I don't want them here or in my front door. I sat down on the deck with my cross-stitch and a cherry Coke. Within 5 minutes, I had 4 yellow jackets buzzing my coke. How do they know? That is quite amazing to me. They were just there. I had to put the Coke in the house before they would leave me alone. Even covering the beverage with a small saucer didn't deter them. They left my tea alone, but the coke was a magnet. Oh well, it's the end of the season. A good hard freeze and we'll not see them around. I did a quick walk around the house perimeter to see if there were nests I hadn't seen before in the eaves. I didn't see anything, but they could, like bumblebees, have a very wide range. One of the guys in the office just bought a house and he didn't find the nest until after he'd moved in. They were sliding in behind the back porch light. He sprayed and then sealed the entrance hole but he wonders how big the nest is inside the wall. Short of ripping the wall apart, he probably won't know. He now has to wait until spring to see if they have another way out and, hopefully, that's NOT into his house. Wasps and yellow jackets remind us that as much as we think we have conquered the world, it still finds ways to humble us. I Won't Call it "George"